La Mesa Blvd is romantic at night. The tree-lined boulevard twinkles with white lights. People meander, window shopping, enjoying new gourmet restaurants or old favorites. 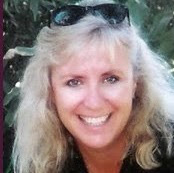 Others browse antique stores or plan vacations at the travel agency. 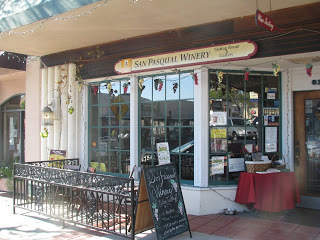 We dipped into San Pasqual Winery for a wine and chocolate pairing. This was a perfect way to spend Valentines Eve. San Pasqual Winery, an urban winery whose tasting room is on the Boulevard hosts an annual Valentine’s wine and chocolate pairing event for guests and wine club members. This fun evening features five wines with desserts from San Diego Desserts. “Toast of the Town”, a Brut Sparkling Wine, is a chardonnay and Pinot Noir blend of wine crafted in the classic Methode Champenoise. This was paired with a white chocolate covered strawberry. “Classy but Sassy”, a sparkling wine cocktail with a splash of their “Habanero” passionfruit wine was paired with chocolate-orange mousse. This cocktail is very drinkable and surprisingly delicious! 2008 Santa Barbara GSM Blend (Grenache, Syrah, Mouvedre) paired nicely with a Raspberry Linzer cookie. My tasting notes say “Yum!” for this wine. I am a big sucker for this classic Rhone blend. 2008 El Dorado Tempranillo paired with a Chocolate Peanut Butter Cup. As a peanut butter purist, I didn’t care for this pairing. In my opinion wine and peanut butter don’t mix. However, the Tempranillo was rich and full. I wrote in my notes “very unique, a bit sweeter” than other Tempranillos I have had. The tasting room staff and we had fun deciding which wine would be better with the peanut butter. I’m not sure which one they finally decided on, but it was fun trying. Lastly a Tawny Port paired with a salted caramel fudge cup. The port had a very nutty flavor, the tasting notes say “think Raisinets” but with a kick. All wines were in the $20-25.00 range and very drinkable. A fun wine to try is their “Habanero” passionfruit wine. I know sounds weird, but tastes freakishly good! Linda McWilliams, the winemaker, was a student of Jim Hart, winemaker at Milagro Farm Vineyards, and Adam Caruth, of Caruth Cellars. Currently, the wine production site is in Pacific Beach but owners Linda and Mike McWilliams have plans to move this to a larger facility in La Mesa, allowing them to double their production to 3,000 cases annually. We are lucky to have this urban winery in our neighborhood. It is great to be local, and we can practically walk there.